Create a new project, named “Assignment10”, and use the “Web app project v1” template (which includes the Chinook sample database). 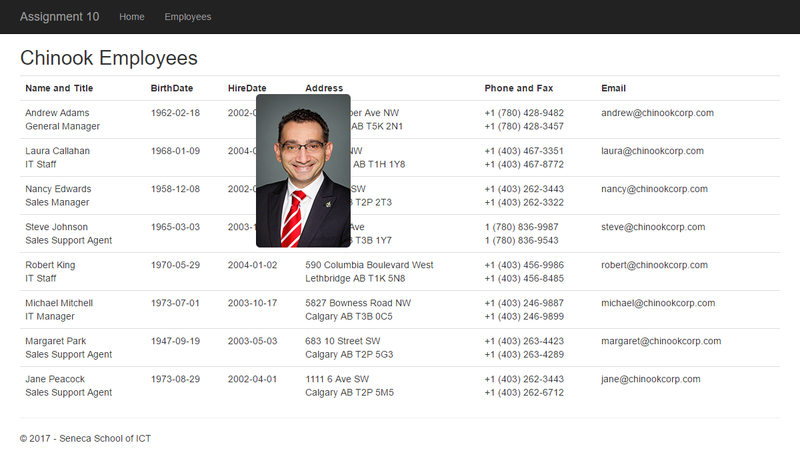 Display a list of employees, sorted by last name (then first name). 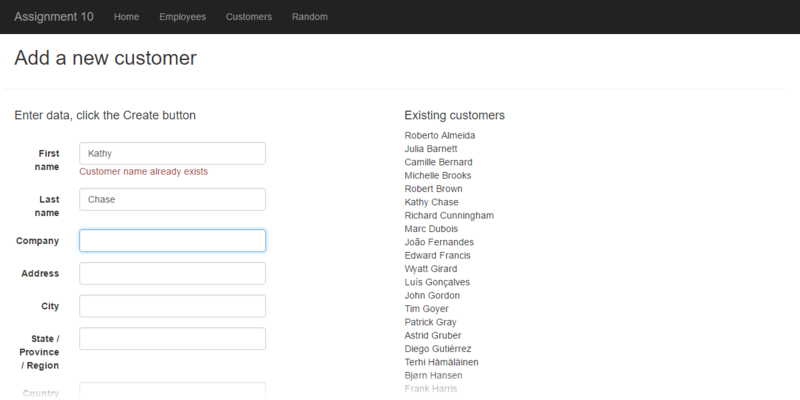 Display a list of customers, sorted by last name (then first name). In this task, the idea is to modify the document when an event happens. For this task, you can follow this summary of techniques, while also referring to the code examples. Some additional guidance appears below. Photo name? Good question. Remember what we’re doing here – showing a photo in response to an event. When the event fires, what do we know? Well, we probably know (or have access to) data that identifies an employee on the list. Maybe their name, right? So, set/configure the name of each photo in a meaningful manner that will help your coding task succeed. Where to store them? Good question. How about creating a new folder named “Images” in the root of your project, and saving the photos in there. There are at least two ways to implement the hovering/show photo behaviour. One way is to add the behaviour to the table row, which will work anywhere across width of the row. Another way is to attach it to one area of the row – for example, a small/thumbnail image. Either way, you probably want to watch for the onmouseover and onmouseout events. As above, there is script work to do, and view work. The essential algorithm is that it should watch for the change event on the name fields. 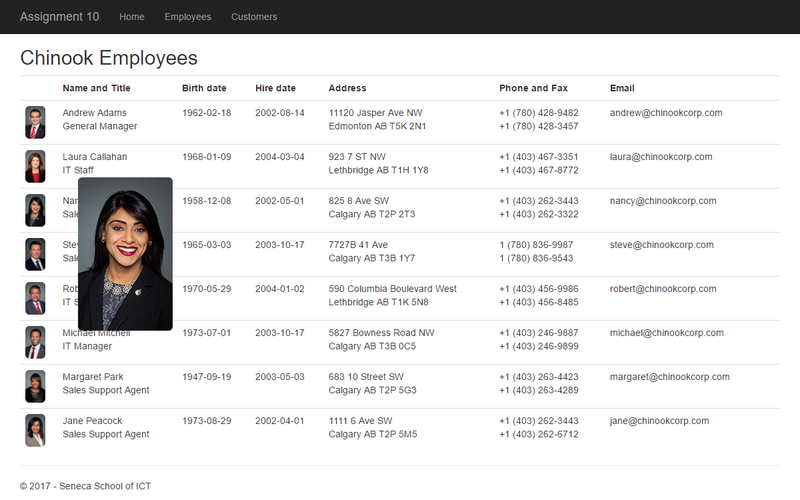 Then, it will use Ajax to send the current values of the name fields to a controller method. The method will check for an existing match, by calling a new method in the Manager class. If found, it returns a string with an error/info message. Otherwise, it returns an empty string. Therefore, in summary, the method is delivering a simple string (not full HTML markup or JSON data). In this task, Ajax will be used to send a request to a public web service that can return some data. You can use any public web service, but be careful and wary. Most will require you to register for a developer key, and must know about your app (which implies that it must be publicly hosted etc.). Probably too high a barrier for this assignment. The teacher team used a web service from the JSONPlaceholder web site. It has a number of resources URLs available (/posts, /users, /photos, etc.). Before writing code, look at the data returned by the resource URLs, and decide which data set you wish to render on your page. 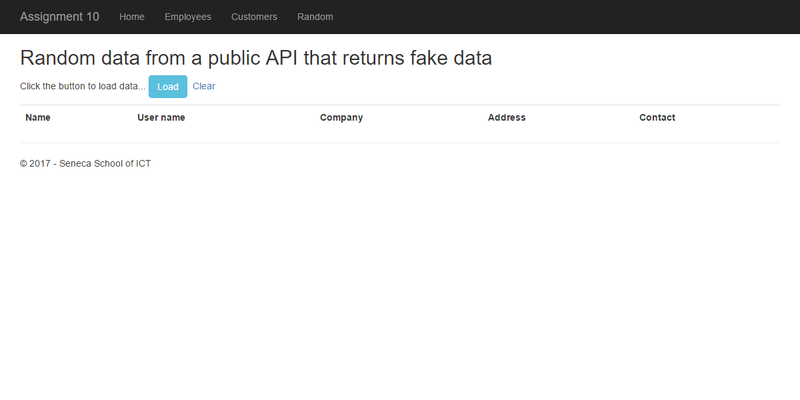 You can use the formatted JSON viewer that’s published by CuriousConcept.com. To keep this simple, we suggest that you just add a new method to an existing controller (Home or Customers). The only purpose of the method is to show the view. Remember to add a menu choice to _Layout.cshtml to easily get to this new action/method. 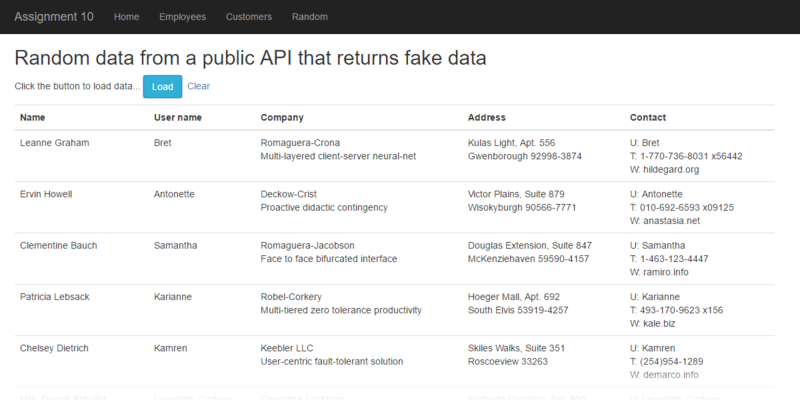 Write a function that will manage an Ajax request to a web service, and then render the response data in an HTML Table. Assume that the view will have the <table> tags, and the header row (<th> elements). Also assume that it will have a <tbody> element with its “id” attribute configured, so that you can get a reference to it from the code. Then, write the table structure, including the header row titles. Make sure that it has a <tbody> element that can be referenced from code.